This application is a division of U.S. Ser. No. 10/374,773 filed Feb. 25, 2003, and claims priority and benefits thereof. More preferably, the interpolymer is not characterized by a high degree of either isotacticity or syndiotacticity. This means that in the carbon−13 NMR spectrum of the substantially random interpolymer the peak areas corresponding to the main chain methylene and methine carbons representing either meso diad sequences or racemic diad sequences should not exceed 75 percent of the total peak area of the main chain methylene and methine carbons. wherein R1 is selected from the group of radicals consisting of hydrogen and alkyl radicals containing from 1 to about 4 carbon atoms, preferably hydrogen or methyl; each R2 is independently selected from the group of radicals consisting of hydrogen and alkyl radicals containing from 1 to about 4 carbon atoms, preferably hydrogen or methyl; Ar is a phenyl group or a phenyl group substituted with from 1 to 5 substituents selected from the group consisting of halo, C1-4-alkyl, and C1-4-haloalkyl; and n has a value from zero to about 4, preferably from zero to 2, most preferably zero. Exemplary vinyl or vinylidene aromatic monomers include styrene, vinyl toluene, α-methylstyrene, t-butyl styrene, chlorostyrene, including all isomers of these compounds, and the like. Particularly suitable such monomers include styrene and lower alkyl- or halogen-substituted derivatives thereof. 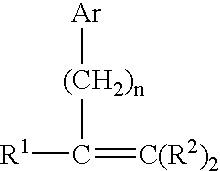 Preferred monomers include styrene, α-methyl styrene, the lower alkyl- (C1-C4) or phenyl-ring substituted derivatives of styrene, such as for example, ortho-, meta-, and para-methylstyrene, the ring halogenated styrenes, para-vinyl toluene or mixtures thereof, and the like. A more preferred aromatic monovinylidene monomer is styrene. The substantially random interpolymers include the pseudo-random interpolymers as described in EP-A-0,416,815 and EP-A-0,765,888 by James C. Stevens et al. and U.S. Pat. No. 5,703,187 by Francis J. Timmers, both of which are incorporated herein by reference in their entirety. The substantially random interpolymers also include the substantially random terpolymers as described in U.S. Pat. No. No. 5,872,201 which is incorporated herein by reference in its entirety. Also suitable are the substantially random interpolymers, which comprise at least one α-olefin/vinyl aromatic/vinyl aromatic/α-olefin tetrad disclosed in U.S. Pat. No. 6,191,245 B1 also incorporated herein by reference in its entirety. Examples of suitable catalysts and methods for preparing the substantially random interpolymers are disclosed in EP-A-0,416,815; EP-A-514,828 (U.S. Pat. No. 6,118,013); EP-A-520,732 (U.S. Pat. No. 5,721,185); as well as U.S. Pat. Nos. 5,055,438; 5,057,475; 5,096,867; 5,064,802; 5,132,380; 5,189,192; 5,321,106; 5,347,024; 5,350,723; 5,374,696; and 5,399,635; 5,470,993; 5,866,704; 5,959,047; 6,150,297; and 6,015,868; all of which US patents are incorporated herein by reference. The substantially random α-oelfin/vinyl or vinylidene aromatic interpolymres can also be prepared by the methods described in JP 07/278230, or by the methods described by John G. Bradfute et al. (W.R. Grace & Co.) in WO 95/32095; by R. B. Pannell (Exxon Chemical Patents Inc.) in Wo 94/00500; and in Plastics Technology, p. 25, (September 1992), all of which are incorporated herein by reference in their entirety. Unless otherwise stated, the molecular weight of the polymer compositions for use in the present invention is conveniently indicated using a melt index measurement according to ASTM D-1238, Condition 200° C./5 kg ( and also known as I5). Valtec ™ is a high flow polypropylene from Basell North America, Incorporated. 1. A method of making a shell mold for casting a metal or alloy, comprising providing a fugitive pattern having a shape of an article to be cast of the metal or alloy, said pattern comprising a pattern material comprising A) a substantially random interpolymer prepared by polymerizing one or more α-olefin monomers with one or more vinyl or vinylidene monomers and B) a low molecular weight polymer other than said interpolymer, investing said pattern in a shell mold, and removing said pattern from said shell mold by melting said pattern without cracking said shell mold. 2. The method of claim 1 wherein said pattern is melted by flash heating. 3. The method of claim 1 wherein said pattern is melted by steam autoclaving. 4. The method of claim 1 wherein said interpolymer comprises ethylene/styrene interpolymer. 5. The method of claim 4 wherein said low molecular weight polymer comprises low molecular weight polystyrene. 6. The method of claim 1 further including in said pattern a thermoplastic polymer other than said interpolymer and said low molecular weight polystyrene. 7. A method of making a shell mold for casting a metal or alloy, comprising providing a fugitive pattern having a shape of an article to be cast of the metal or alloy, said pattern comprising a pattern material comprising A) a substantially random interpolymer and B) a low molecular weight polystyrene. 8. A method of making a shell mold for casting a metal or alloy, comprising providing a fugitive pattern having a shape of an article to be cast of the metal or alloy, said pattern comprising a pattern material comprising A) ethylene/styrene interpolymer and B) a low molecular weight polystyrene. 9. The method of claim 8 wherein said ethylene/styrene interpolymer is present in an amount of 10% to 95% by weight of said pattern material and said low molecular weight polystyrene is present in an amount of 5% to 60% by weight of said pattern material. 10. The method of claim 9 wherein said ethylene/styrene interpolymer is present in an amount of 30% to 80% by weight of said pattern material and said low molecular weight polystyrene is present in an amount of 10% to 50% by weight of said pattern material. 11. The method of claim 10 wherein said ethylene/styrene interpolymer is present in an amount of 50% to 70% by weight of said pattern material and said low molecular weight polystyrene is present in an amount of 20% to 50% by weight of said pattern material. 12. The method of claim 11 wherein said ethylene/styrene interpolymer is present in an amount of about 60% by weight of said pattern material and said low molecular weight polystyrene is present in an amount of about 40% by weight of said pattern material. 13. The method of claim 8 wherein the low molecular weight polystyrene has a molecular weight (Mn) <10,000. 14. The method of claim 13 wherein the average molecular weight is <5,000. 15. The method of claim 14 wherein the average molecular weight is <2,000. J. C. Randall; Polymer Sequence Determination; Academic Pres New York; 1977; pp. 71-78.